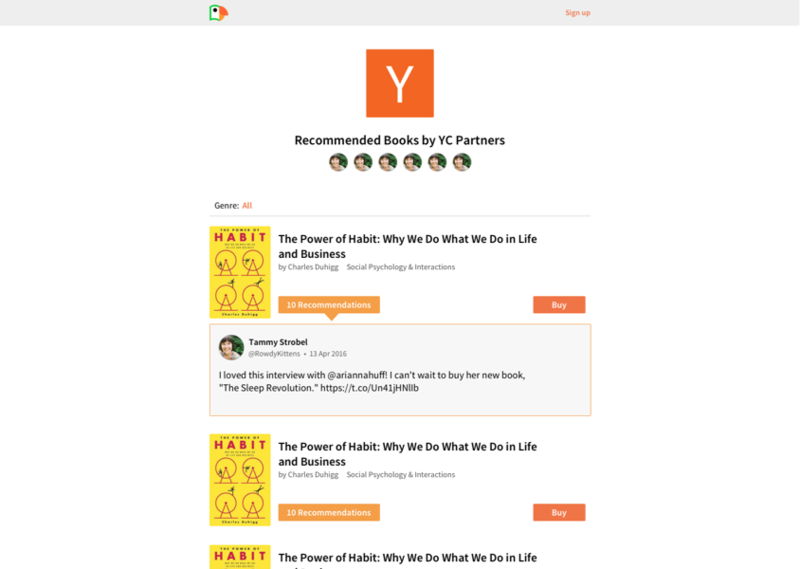 ParrotRead shows you book recommendations from people you follow on Twitter. I decided to build it because I love books and I found Twitter to be one fo the best ways to get book recommendations. It’s hard to follow every recommendation Twitter: You're missing great book recommendations all the time. Even if you're lucky enough to open Twitter exactly when someone you follow recommends a book - it's never the right time. It’s not there when you need it the most: When you want to buy a new book, it's really hard to find reviews on this book from people you respect. You want reviews from people you respect: Reviews from random people on Amazon is not good enough. 1 review from someone you know and respect is better than 100 reviews from random people. Using ParrotRead, you can get book recommendations from people you follow on Twitter without looking at Twitter at all. 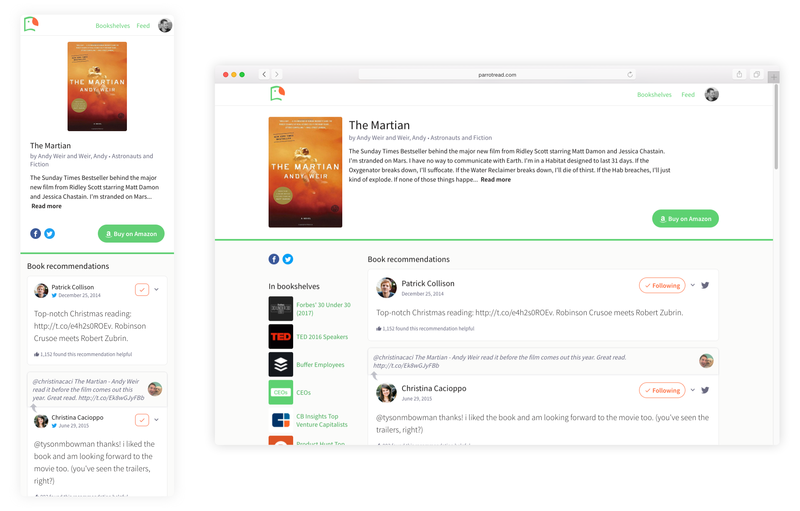 ParrotRead automatically collects book recommendations from your Twitter feed, so you can access them anytime you need them. Focus on people: ParrotRead is all about people. A good recommendation is a recommendation from someone you respect. Build as less as possible: We have many ideas, but ParrotRead is a side project - time is super limited. ParrotRead is a side project, and I'm building it with a partner. My main responsibilities are product design, front-end development (React/Node.js), and marketing. Although it wasn't clear at the beginning, we decided to mainly use Twitter login for ParrotRead. Since you already follow people you respect on Twitter, it makes sense to mimic the behavior on ParrotRead as well (including sync of your followers/following). 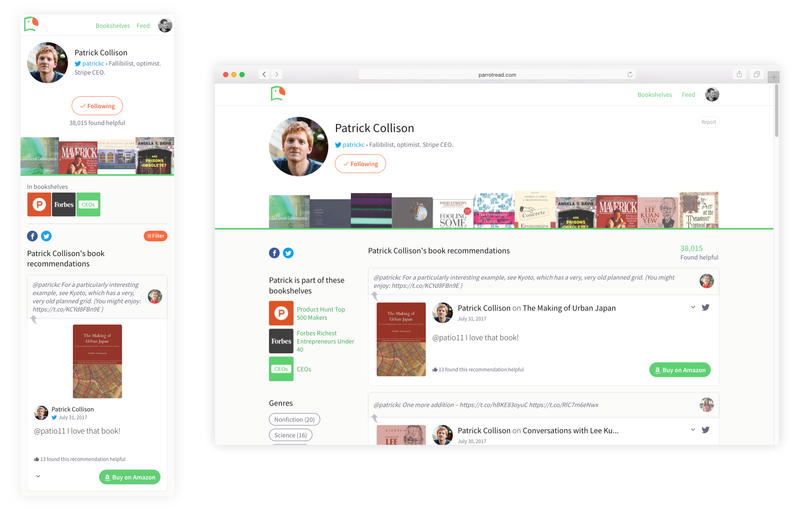 Right after you sign up, ParrotRead scans your Twitter and shows you a feed of books recommended by people you follow on Twitter. 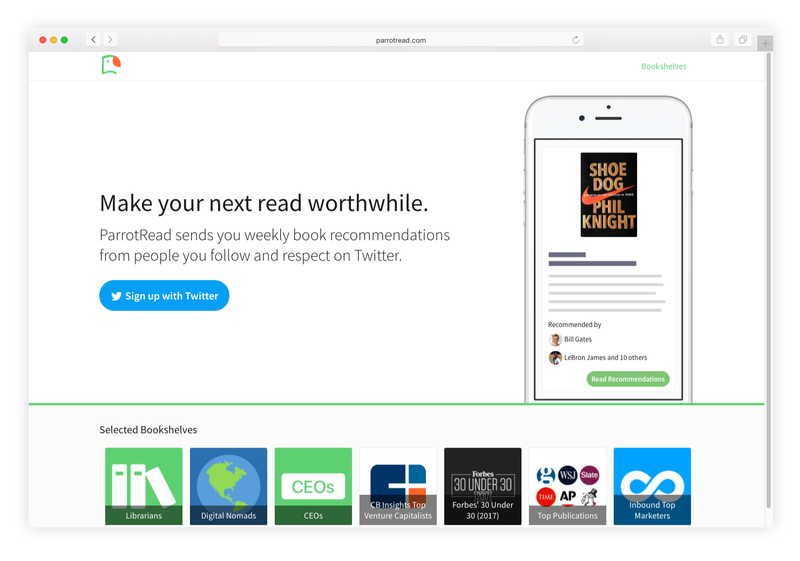 However, since it takes time to scan all of your Twitter feed, the onboarding is not ideal at the moment (it's a technical barrier and we hope to make it better over time): ParrotRead sends you an email once your book recommendations feed is ready, and only then you can start getting personalized recommendations. The most important/powerful part of a book component, as you can see below, is the "Recommended by" section - because this way you can see why this book is recommended for you, and who recommended it. It was very important to leave space for people's faces (and not only names and numbers) so it will be easier to recognize. Early on, it was clear that recommendations are the most important component in a book page, and that was the focus in all mockups since the beginning. 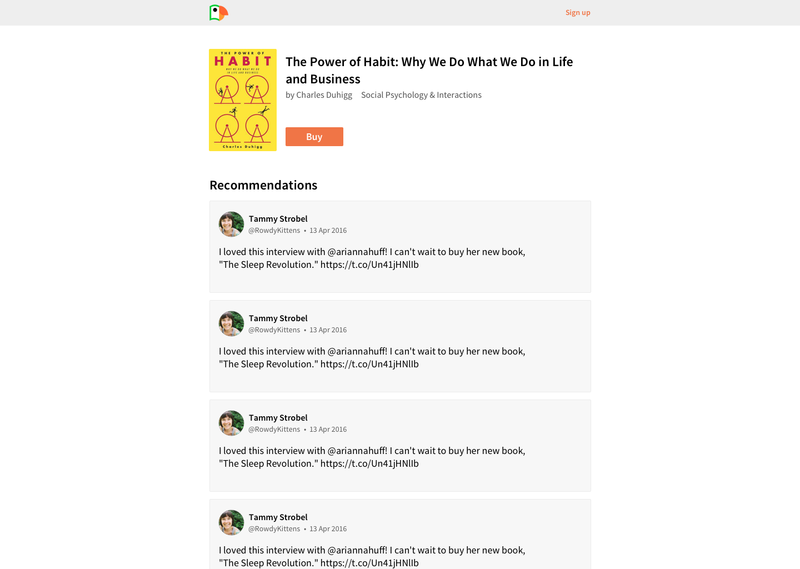 In addition to the content itself, a recommendation component contains the person who recommended the book (big profile picture and name to emphasize the importance of people on ParrotRead), date, link to the original tweet, and a follow button. 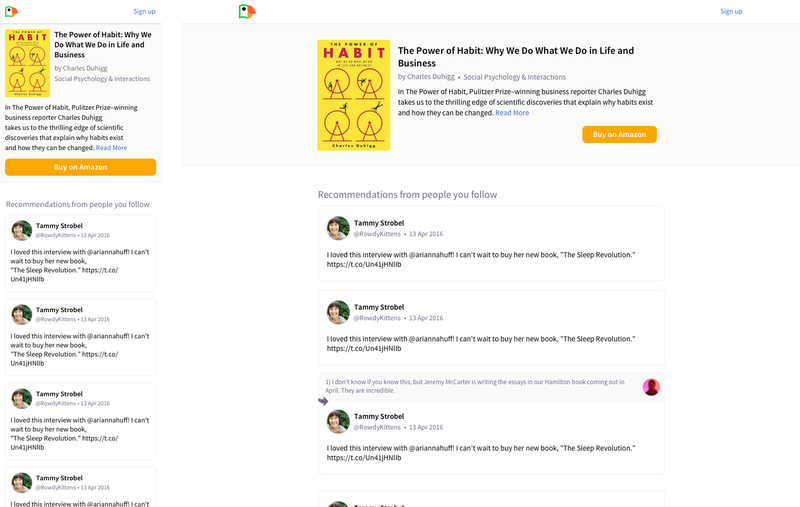 If you're logged-in, you'll first see recommendations from people you follow (on Twitter or ParrotRead) and then recommendations from people you don't follow (with an option to follow them - this helps in discovery between people on ParrotRead + an indication about your relationship with each person). ParrotRead's book page. Click to see it live. ParrotRead is all about people - who is the person that recommended the book and what they said about it. We believe that this is the most important thing when you decide what to read next. The profile header contains recent books you recommended as a quick overview of yourself. The idea was to mimic the feeling you have when you enter someone's room and look at his/her bookshelf. The recommendation component in a profile is in a similar style as other related components. Although it's a profile page, each component contains the person's profile picture and name again and again, to emphasis the importance of who wrote it. ParrotRead's profile page. Click to see it live. A bookshelf is a list of recommended books by a group of people. 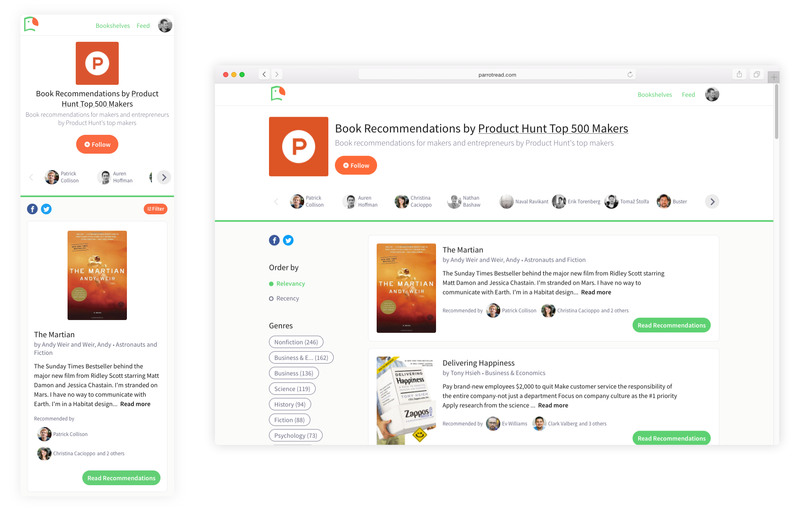 We curate a list of usernames on Twitter (Dribbble's top designers, Product Hunt's top makers, CEOs, VCs, etc) and collect all their book recommendations into one list - a bookshelf. 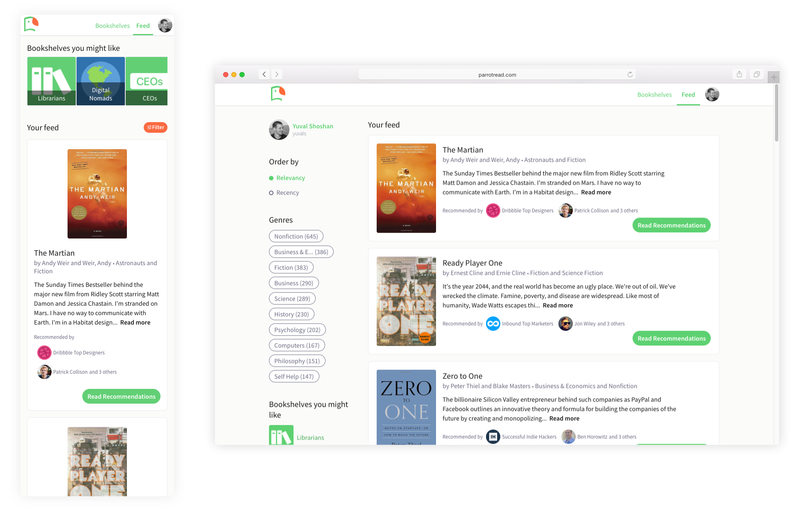 In terms of visual design/front-end, bookshelves are very similar to the feed (same book component). As you can see, again, the emphasis is on people: at the top, there is a list of people that included in the bookshelf, and in each book there are faces of people that recommended it. Bookshelves are important because (1) they enable us to create an interesting list of books recommended by a specific group, (2) we use them for content marketing. Most of the people that visit ParrotRead land on a bookshelf or profile page, not the homepage. Bookshelf. Click to see it live.